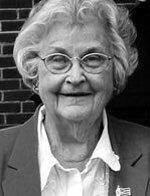 Mrs. Frances Holloway Swartz, age 96, of Covington, Virginia, passed away August 7, 2014 in Staunton. She was the wife of Roy E. Swartz. Mrs. Swartz was born July 25, 1918 in Smithfield, the daughter of the late Elmo E. Holloway and Mary Ramsey Holloway. She was a graduate of Longwood College and a longtime educator in the Covington School System. Frances was a member of First Presbyterian Church, where she served her church as a Sunday school teacher and in numerous other capacities. She was a member of the Daughters of the American Revolution, the United Daughters of Confederacy, enjoyed being a volunteer in various organizations and often visited shut-ins and friends in nursing homes. Mrs. Swartz is survived by her daughter, Mary Hunter Smith and husband, Bill of Winston-Salem; sons, John Swartz and wife, Denise of Staunton and Roy Swartz and wife, Wanda of Buena Vista; her son-in-law, Bob Hatcher of Chattanooga; ten grandchildren; eleven great grandchildren; and a number of nieces and nephews. In addition to her parents and husband of 59 years, Mrs. Swartz was preceded in death by her daughter, Elizabeth Hatcher. A funeral service was conducted at 4:00 p.m. Sunday, August 10, 2014, at First Presbyterian Church with Pastor Jamie Pharr Lloyd officiating. Interment will follow in Alleghany Memorial Park. Pallbearers were Mrs. Swartz's grandsons. The family received friends on Sunday afternoon until service time at First Presbyterian Church. The family suggests that memorial tributes be made the Alleghany Highlands Free Clinic, 322 W. Riverside Street Covington, VA 24426. Funeral arrangements were handled by Loving Funeral Home; www.lovingfuneralhome1913.com.